R-L: OTUNBA SEGUN RUNSEWE, DG NATIONAL COUNCIL FOR ARTS AND CULTURE DECORATING FATIMAH SULE, COORDINATOR OF FASHION DESIGNERS ASSOCIATION OF NIGERIA DURING A COURTESY CALL TO THE CENTRAL BANK OF CULTURE IN NIGERIA RECENTLY. 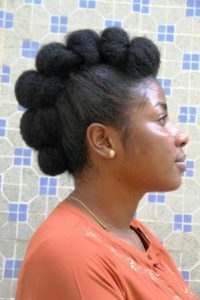 All is now set for the unveiling of the official hair style and dress code for the 10th edition of the African Arts and Craft Expo (AFAC) holding from August 27th to September 17th this year. 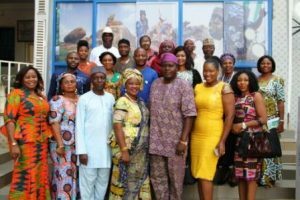 The Director-General of the council, Otunba Olusegun Runsewe made this declaration while receiving members of the Fashion Designers Association of Nigeria (FADAN) at the headquarters of the National Council for Arts and Culture (NCAC) in Abuja as preparations for the Expo hits top gear. 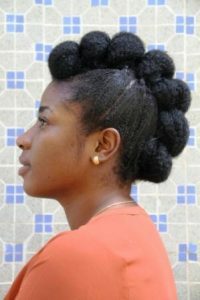 During the courtesy visit, the DG announced the endorsement of ‘Abahi’ hair style typically adorned by the Benue people of North-central Nigeria affirming that the beautifully styled hairdo will make a very strong cultural statement during AFAC and stimulate the creativity of Nigerians. Addressing the delegation, the NCAC boss identified possible ways the association and its members can partner with the Council starting with AFAC to create thousands of jobs which will translate to massive improvement in both the local and national economy while empowering the youths to become entrepreneurs. The Culture boss stressed that fashion remains a huge global industry capable of enhancing the socio-economic condition of the country in terms of employment generation while advising members of FADAN to work on their corporate brand identity and ensure greater cooperation sighting instances abroad where Designers form partnerships to create unique attires. 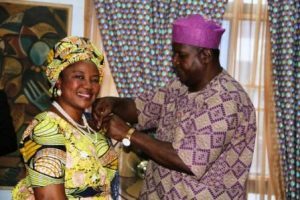 NCAC HOSTS THE NEWLY INAUGURATED FTAN EXCO…..PICTORIAL NEWS.